OMR sheets are special documents that are usually used for multiple-choice questions. These sheets contain blocks or bubbles as answer options. But what really make these sheets different are the index points found on the four corners. These index points help the software to detect and read dark marks on the sheets.The OMR designing software helps you to design different forms of OMR sheets. Once the sheets are designed, they have to be printed by following certain rules and regulations. 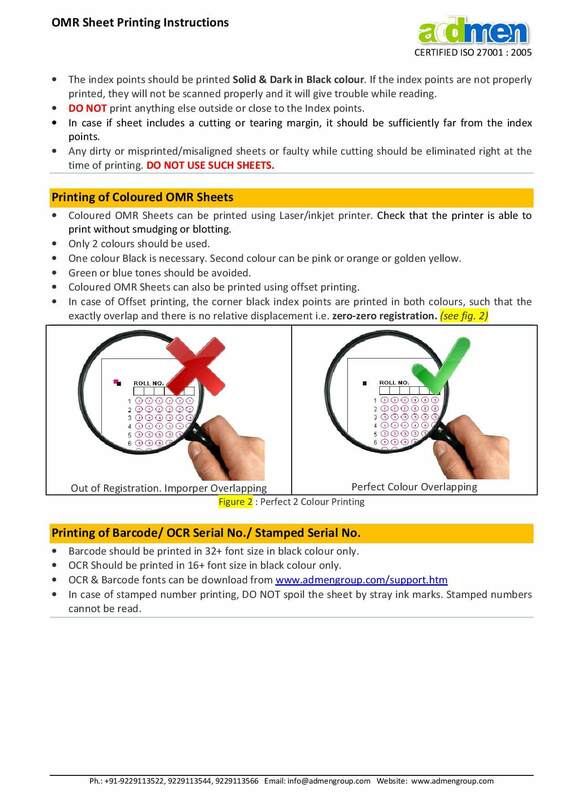 With this note, let us take a look at the guidelines for printing OMR sheets. You should not tamper with the OMR sheet design format. Do not increase or decrease the page size. The size of the OMR bubbles should not be increased or reduced. Also, thickness of the bubbles should be kept to the minimum as too thick sized bubbles may lead to inaccurate reading as the software is likely to consider it as a filled bubble. The content inside the OMR bubbles should have thin or small font. The index points should be printed correctly and clearly. They should be solid black in color. There should be enough white space around the index points. Hence, it is best to print on the center page. Do not remove the index points under any circumstances. There should be no cutting or tearing margin near the index points. Make sure to keep the margin at a good distance from the margin. Nothing should be printed near or outside the index points. In case the marking pattern on OMR sheets is tick mark or thin strokes, it is best to use colored OMR sheets. If the marking pattern requires candidates to fill the OMR bubbles completely, it is sufficient to use black and white OMR sheets. Colored OMR sheets require the use of two colors. One of them should be black and the other can be red, yellow, pink, orange, etc. Refrain from using green and blue colors. 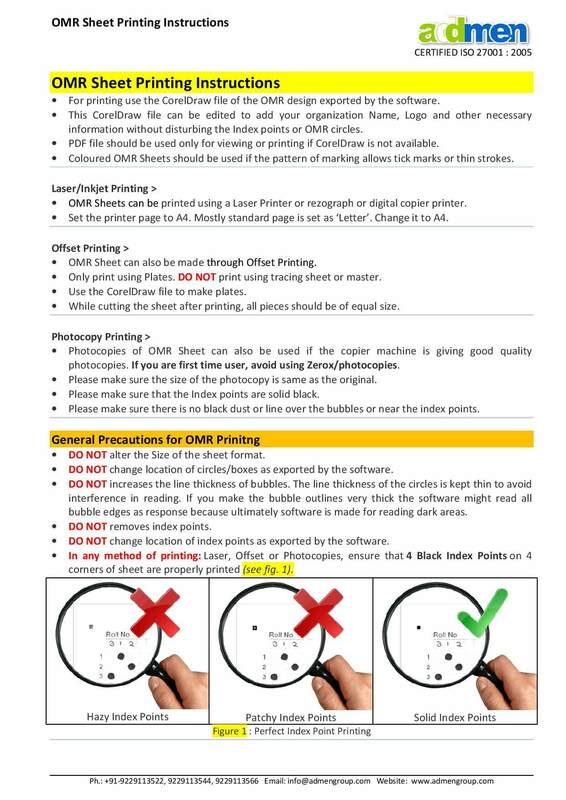 An important thing that you have to keep in mind is that OMR sheets that are misprinted, misaligned or dirty should not be used in any circumstances. It is best to dispose such sheets immediately.